This note demonstrate how to use a schedule to automatically turn off LED lights during night time and turn the lights back on in the morning. Note: Please check that the Time and Date iscorrectbefore using Time Schedule (Refer to How to Set Time and Date for detailed instruction). 1. 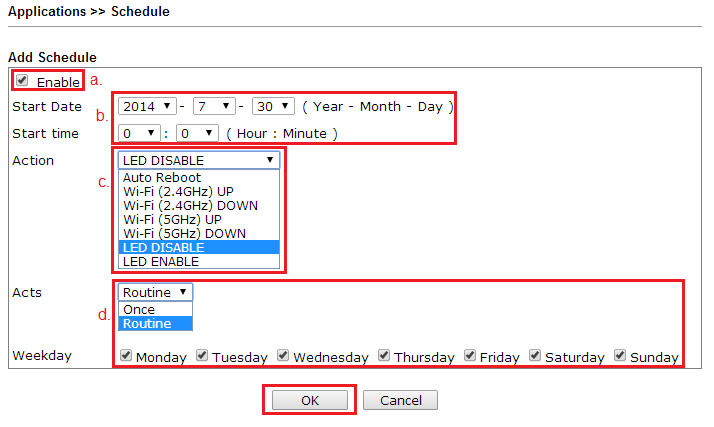 Enable Schedule: Go to Applications >> Schedule, check Enable Schedule, and click OK to save. 2. Create a new schedule: Go to Applications >> Schedule, click Add a new one. a. 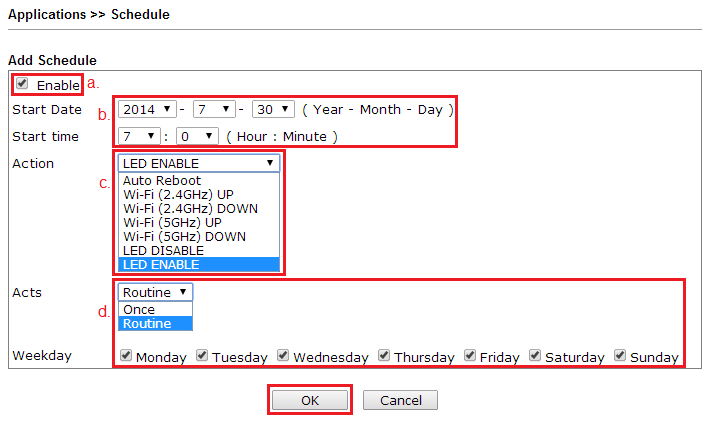 Enable this Schedule profile. b. Set Start Date and Start time for the lights to turn off. c. Choose Action as LED DISABLE. d. Choose Routine for Acts, and tick the Weekdays for the schedule to apply. e. Click OK to save. 4. Set a schedule to turn on LED lights in the morning. b. Set Start Date and Start time for the lights to turn on. .
c. Choose Action as LED ENABLE. d. Choose Routine for Acts, and tick Weekdays.